Paxi, a little island just 8 miles south of Corfu will capture your heart from the first moment you look at it. Its surface is only 25 square kilometers, but it is covered with more than 300.000 olive trees and it produces one of the best qualities of olive oil in Greece. Its eastern coast slopes gently into the sea and has many little coves along its length, while the rocky western coast drops vertically into the water from as high as 200 meters. 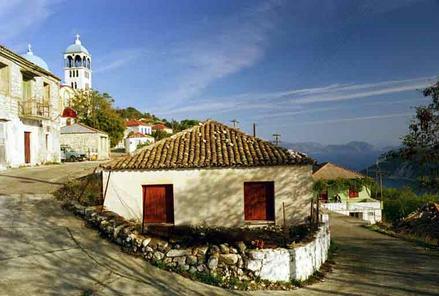 The little village of Gaios which is the capital of the island is a natural harbor with its deep bay whose entrance is protected by two little islands with a castle and a monastery on them. 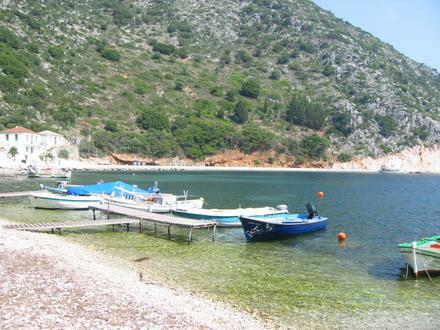 It is picturesque and quite lively with a number of tavernas, cafés and bars. Sailing around the island you will find many beaches, most of which are isolated, as well as marine caves and other natural wonders. Some of them are the cave of Kastanidas at the base of a vertical rock 190m high, the cave of Ortholithos with the massive monotith in front of its entrance, the cave of Ypapandi which is a refuge for seals and the natural stone arc of Tripito. You have to live this unique experience of going for a swim in a sea cave or at least just row inside them with the inflatable dinghy! Just 3 miles to the south of Paxi is the little island of Antipaxi with only 100 people living on it. It is worth a visit as on its north-east coast is situated one of the bays with the most beautiful turquoise colors of the Med!